Home Education What is a Thermal Fogger and a Mister? When is it Used? What is a Thermal Fogger and a Mister? When is it Used? Don’t get foggers and misters confused because I know I did when I first got into the industry. The difference is how the chemical is expelled out of the machine. Mister – A mister will be an electric device with a tank for the chemical. You will add the chemical to the tank, turn on the machine, and apply to the area needed. Chemicals to use: If using a mister you are probably going to be using a water based chemical. This way you can use a concentrate and then dilute with water. Misters will expel the chemical/water mixture just like a spray bottle will. The difference is the amount of time spent, giving you more efficiency with your work. Misters are used when you are applying a chemical to a specific location. These locations will be areas like carpet or sub floors where urine contamination is an issue. Another great application for a mister is combating mold. There are many chemicals which can be purchased to combat mold. These chemicals are to be applied directly to the mold in a mist form. Chemicals to use in a mister would be mold inhibitors, deodorizers, disinfectants, flame proofing chemicals, fabric protectors, and more. 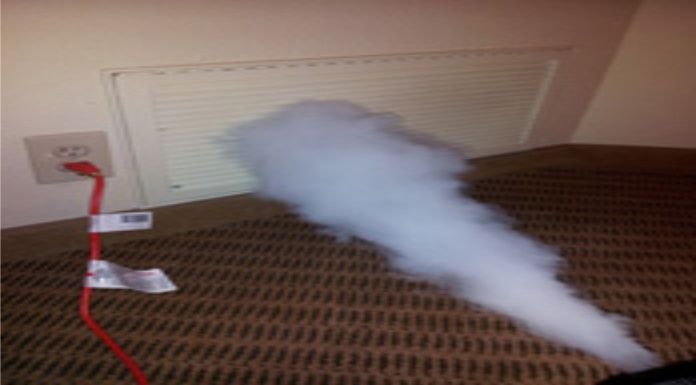 Thermal Fogger – A thermal fogger allows for oil based chemicals to be atomized into a fog to cover large areas. Areas such as crawl spaces, attics, rooms and or entire homes, and more. Thermal foggers must only be used in conjunction with thermal chemicals. Foggers have heating elements which allow the chemical to turn into a fog. Running water based chemicals out of a thermal fogger will be ineffective and most likely it won’t work at all. Chemicals to use: I personally use Unsmoke OdorX products through my fogger. This particular brand makes deodorizers which comes in fragrances like cherry, lemon, citrus, kentucky blue grass, and a neutral scent. For cigarette odor removal I like to run their Tabac-Attack product through my fogger. I am sure there are many more chemicals to use and if so post them in the comment section below. Thermal foggers work great when customers are dealing with a large breed dog odor in their home or car, and to remove cigarette odors as well. The fogger is also designed for fire restoration. The fog allows for the chemical to fill the space reaching the same areas as the fire’s smoke has gone. If you have more information on foggers and their usage post a comment below for everyone to learn from. Thanks for Reading.